So, what is iMPRESSION? It is a super cool, casual way to use your smart phone to help you reveal a thought-of word, number, or picture. This is a method or technique that you will be able to have on you without carrying extra stuff (unless you want to! ), as the pen and paper the spectator writes their thought on is completely un-gimmicked -- so it can be borrowed. I developed this idea into a full routine, as I truly believe it has merit and is a completely overlooked application of your mobile phone within the magic and mentalism world. "That's cheeky! Your brain is ridiculous! I love it!" "There is nothing better than the ordinary enabling the extraordinary. Ben has taken something so normal and innocent and turned it into a wonderful tool. This is only the beginning." "Lol Ben, you cheeky s**t! Love it mate...!" "Very simple, direct mind reading with something everyone owns but never thinks to use in this application. I will be using this, I love stuff like this!" "You sneaky bas***d! Love the idea, I can't wait to perform this!" Here's the best thing about this technique: every time you do this, you can get a great video of you performing an impossible, ultra clean mind read on someone. You don't need to do this, but the option is there, which makes for a great way to grow your social media following. You can perform this effect, get a really pure mind reading video of the performance, and then post it immediately tagging and linking with the spectators, thus drawing them into your social media circles in a fun and simple way. During the tutorial, I talk about cool scripting and pre-show that you can employ for these videos to make them look even more impossible. - That they have written or drawn something of their own free choice which wasn't seen by anyone (unless they chose to show someone). And that they, themselves, placed it in their own pocket. - You have not set anything up beforehand. For example, you never instructed them to draw anything limiting or suggested anything to sway their decision -- they aren't a stooge in any way, shape or form. - You have not done anything sneaky, and there is no way you can know what they just wrote or drew. You can then go on to reveal the exact piece of information they wrote down or drew in a clean manner, without them removing the piece of paper from their pocket. It looks how mind reading should look. There of course is a sneaky method to all of this, but it is very easy, and you can be ready to use this method in literally seconds without any worry of a reset device or having the right wallet with you. Download the video and fry your audience today! 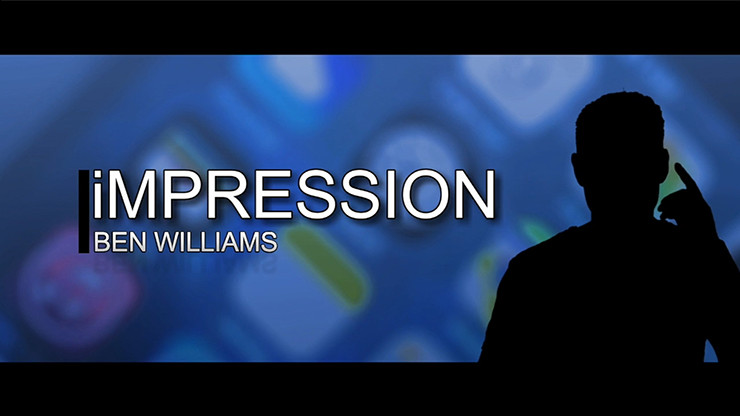 iMPRESSION by Ben Williams video DOWNLOAD So, what is iMPRESSION? It is a super cool, casual way to use your smart phone to help you reveal a thought-of word, number, or picture. This is a method or technique that you will be able to have on you without carrying extra stuff (unless you want to! ), as the pen and paper the spectator writes their thought on is completely un-gimmicked -- so it can be borrowed.